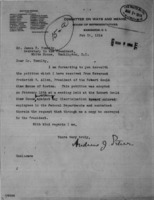 Date is exactly "1914 February 28"
Petition from Rev. Frederick B. Allen et al. against segregation in the federal government, forwarded by Andrew J. Peters.